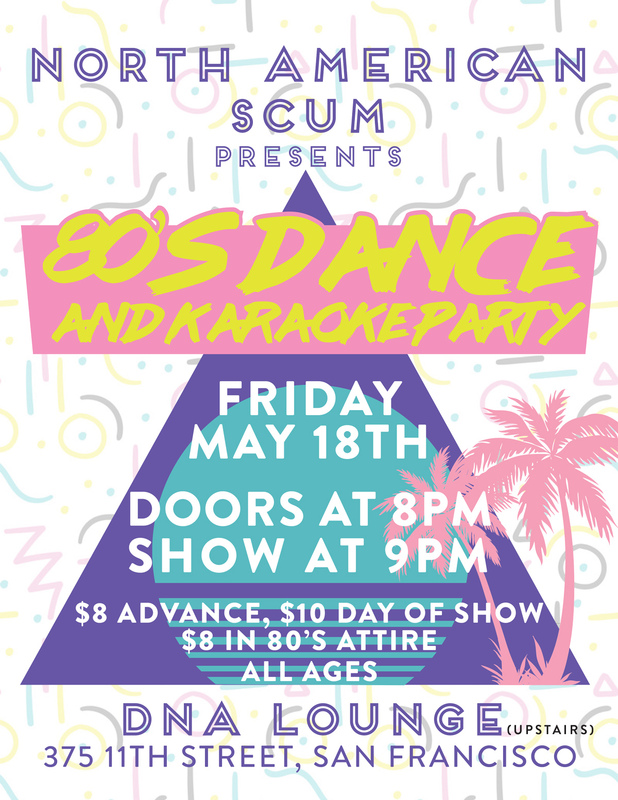 We’re back with another 80s show with live music and karaoke. This time we’re bringing the totally rad party to DNA Lounge (upstairs). We’re also hosting karaoke before and after our live set to give more people the chance to belt out their favorite 80s jams. $10 at the door without a costume so dress up! We’ll be playing a live set of 80’s tunes. 80’s karaoke early in the night for you to jam out on stage! $12 adv but you get $2 off at the door if you’re in costume. We’re teaming up with our friends Suburban Robots to bring you the greatest post-punk tribute night ever: Talking Heads vs. Devo. North American Scum (as Talking Heads) and Suburban Robots (as Devo) are heading to the El Rio to bring you a night of high energy post-punk action. From Whip It to Psycho Killer and everything in between, the two bands will make you dance like it’s the late 70s / early 80s all over again. Relive the years between punk and before New Wave when two bands dropped music that was completely different from what the rest of the world was doing at that time. $8 online and at the door! Are we not men? 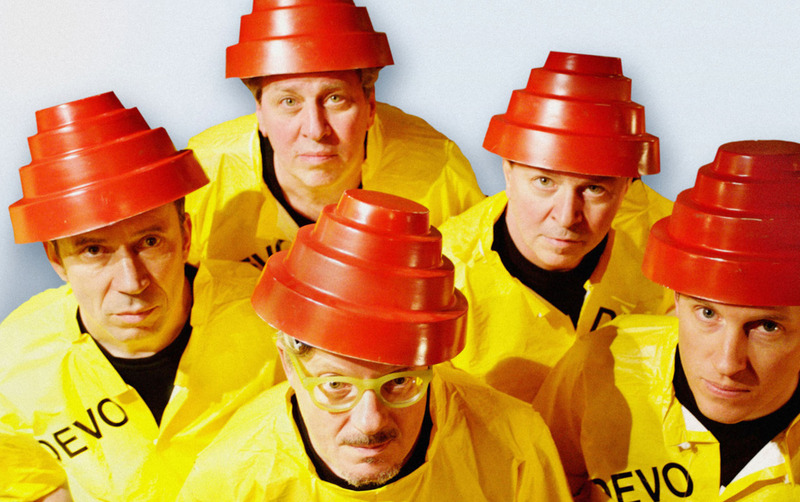 We are DEVO on Friday, September 30th at Hotel Utah. Join us as play all your favorite post-punk songs from the band that made you remember that Akron, Ohio is a real place. We’ll be joined by The Development playing amazing punk and Sons of Fortran rocking your favorite New Wave and 80’s punk classics. Bring you favorite Energy Dome and get ready to twist away those gates of steel. That’s right everyone. 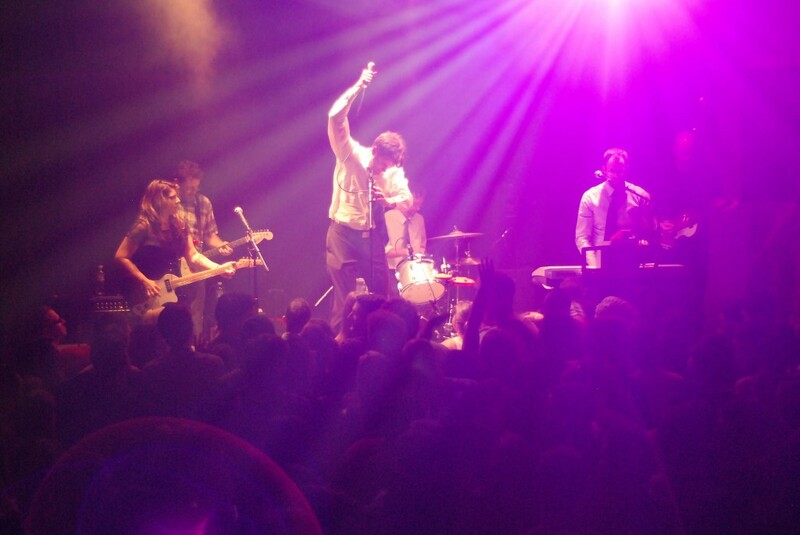 Years after saying we weren’t going to play anymore LCD Soundsystem shows, we’ve changed our minds. Join for as we play all your favorite LCD Soundsystem songs live on May 6 at Verdi Club with DJs Tristes Tropiques, Nutzeffekt, and Nick Pal spinning all the artists and musical movements from Losing My Edge. $10 before 10pm. $12 after so get there early to save $$$$. 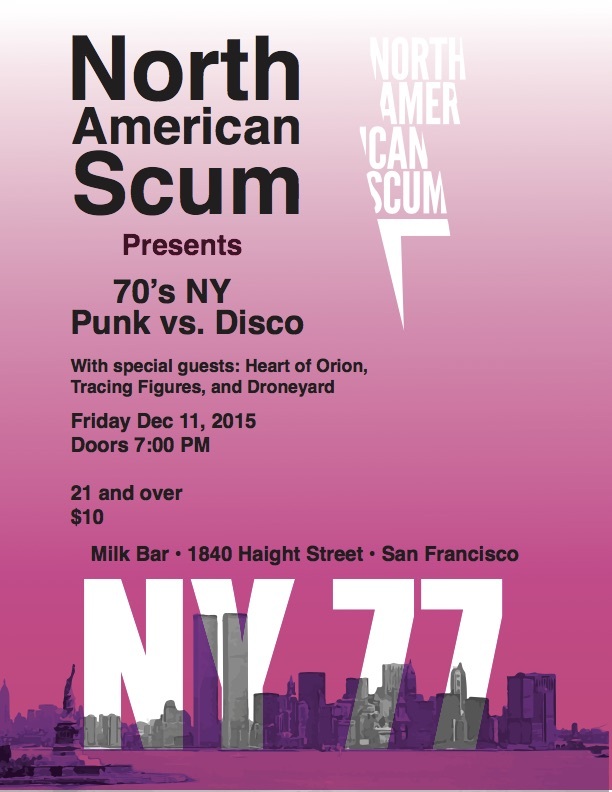 We had so much fun with our NY77: punk vs. disco show, we’re doing it again at Milk Bar in San Francisco. Join us with special guests: Heart of Orion, Tracing Figures, and Droneyard. New York in the 70s produced some of the most important music of 20th century. 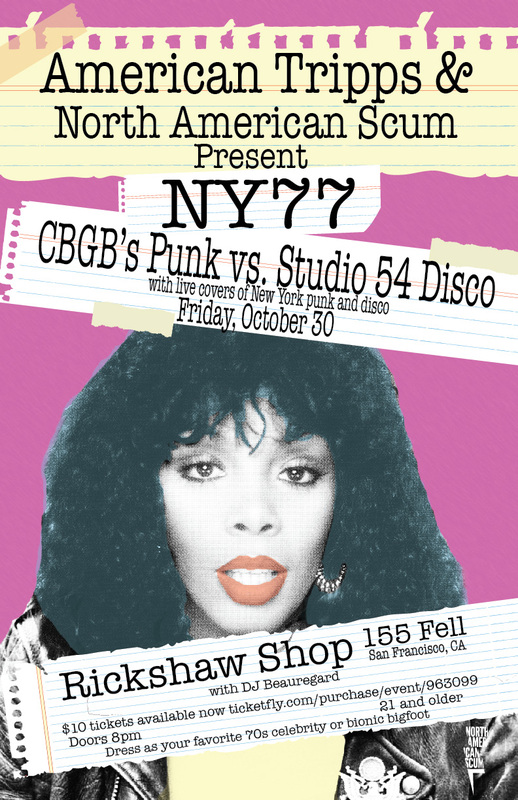 From the gritty punk of CBGB to the dance-heavy disco of Studio 54. On Friday October 30th we’ll be playing your favorite NY punk and disco so dress up as your favorite 70s character, get down to the Rickshaw Stop​ and get ready to dance. Get ready to celebrate America’s birthday with a 2000’s Indie Dance party with the Popscene crew on July 3 at Rickshaw Stop. DJs Aaron Axelsen and Omar will be spinning your favorite indie dance tunes from the 2000s then we’ll take the stage and play live covers of jams from the decade that brought us LCD Soundsystem, Bloc Party and The Rapture. We’re super excited to be playing Slims on May 23 with Smiths/Morrissey cover band This Charming Band and Pixies’ cover band Debased. We’ll be playing our Talking Heads set so get ready to relive your favorite 80s jams from the bands that influenced pretty much every band that came after them.